HOME WEDDINGS EVENTS MUSIC PHOTOS F.A.Q. Third Season Jazz has played at countless weddings all over southern California in the last eight years. Let us help set the mood for your special day with classic jazz. Highly recommended!! We had Third Season for the wedding reception and the flute and guitarist for our ceremony. They were very professional, and played real jazz not lounge-jazz like you hear at most weddings. We loved the vocalist and would recommend adding vocals if you want more than just instrumental jazz. All our guests loved the band! We offer a flute and classical guitar duo which combines the vocal quality of the flute with the harp-like elegance of nylon-string guitar. We can also add a string player to make it a trio. Click the ‘Music’ link for samples. Our most popular group for cocktail hour and the dinner portion of the reception is the traditional jazz quartet, consisting of saxophone/piano/upright bass/drums. For samples, click ‘Music’. We’ll play standards and classic jazz - tunes made popular by Etta James, Frank Sinatra, Miles Davis, Thelonious Monk, and many others. If you’d like to keep it simple we also offer jazz trios or even a duo of saxophone/guitar or saxophone/piano. 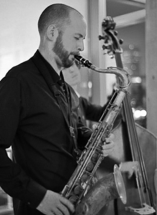 Here’s where we kick it up a notch - for the reception and dancing we can add one of our very talented vocalists to the jazz quartet. We’ll keep it elegant but also get a little funky with some choice soul, motown, and blues tunes. At your request, we can also provide a wireless mic system for toasts and speeches as well as an iPod hookup if you have your own music you’d like to play during the evening. We’d love to hear from you and get started on crafting the music for your big day! Click here to email for more info or to set up a time to meet. Their music was absolutely beautiful. They chose the perfect songs and rhythms for our event. So much better than a DJ. Of all the things we paid for at our wedding, Third Season Jazz was easily our best investment. Congratulations on your engagement and wedding!